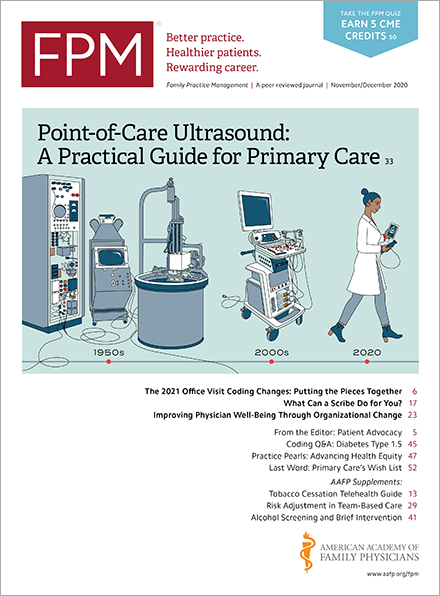 The University of Colorado School of Medicine Department of Family Medicine has won this year’s Family Practice Management (FPM) Award for Practice Improvement. The department was presented with the award Friday during the Society of Teachers of Family Medicine Conference on Practice Improvement being held in Newport Beach, Calif.
FPM Editorial Advisory Board member John Bachman, MD, presented the award to the department’s medical director, Corey Lyon, DO. The program was recognized for its success in implementing a team-based model to address access issues, poor outcomes, and burnout. Implementation included increasing provider support with additional medical assistants and support staff, and expanding their roles. After one year, monthly visits increased 25.6 percent. Staff costs per visit were unchanged, but monthly charges increased 20 percent. Additionally, provider self-reported burnout was reduced by half.